SAN JOSE, Calif., July 30, 2018 /PRNewswire/ — Safeway, which has served San Jose since 1926 and is now part of one of the largest food and drug retail chains in the U.S., will anchor a 100,000 sq. ft. retail center in the North Village of Market Park San Jose. Located immediately adjacent to the soon-to-open Berryessa BART station, when completed Market Park will be the largest transit-oriented development in Silicon Valley, consisting of nearly 4,000 residential units plus approximately 1,500,000 sq. ft. of office space — in addition to retail, neighborhood parks and walking/bicycling paths. Complementing the full-service, 65,000 sq. ft. Safeway store, the North Village’s Market Place shopping center will include a major drugstore, financial institutions, and various restaurants and service businesses. The center’s attractive, modern design by Kenneth Rodrigues + Partners has been created to appeal to the upscale business clientele and residents within the Market Park community. 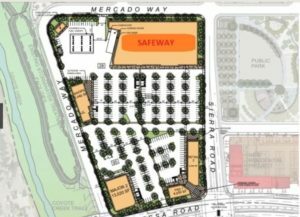 Construction of the retail center is anticipated to commence in the Fall of 2019, with the new next-generation Safeway store expected to open to shoppers in 2020. Project management and office leasing are being led by Borelli Investment Company, while The Schoennauer Company is handling permitting for Market Park. For additional information about the master-planned community, please contact Ralph Borelli or Chris Anderson. Visit www.borelli.com or call (408) 453-4700. Or go to the Market Park San Jose website at marketparksanjose.com.